De Blasio scheduled weekly meetings with aides to discuss an uptick in homelessness this summer. CITY HALL — Mayor Bill de Blasio held a "Weekly Homeless Meeting" for months this summer with top city officials even as he publicly denied the city was experiencing a problem with homelessness, DNAinfo New York has learned. DNAinfo exclusively reported back in August that there had been a roughly 60 percent increase in 311 calls about homeless issues since de Blasio took office. The mayor brushed that off saying he had inherited the homeless surge from his predecessor, Mayor Michael Bloomberg, and blamed media coverage for overplaying the issue. "I think the media has put a lot of attention on this issue lately, more than previously," de Blasio said then. "I'm not sure if the attention that's been given is proportionate to what's happening." The Archdiocese of New York will contribute 150 spaces to a $12 million effort to provide 500 beds for the homeless at faith-based organizations, Mayor Bill de Blasio and Cardinal Timothy Dolan announced on the eve of Pope Francis&apos; visit to the city. It wasn't until a Sept. 1 appearance on WNYC's Brian Lehrer show that the mayor acknowledged what many people already believed to be true. "There is both a perception and a reality problem," de Blasio said about homelessness. But de Blasio had been meeting with city officials about the homeless issue as far back as June 5, according to Corporation Counsel Zachary Carter's schedule, a copy which DNAinfo obtained through a Freedom of Information Law request. The FOIL request covered the period through the end of July. De Blasio was cc'ed in the email to Carter from de Blasio's then-scheduler Michael Carey. The group met at least five times through July 24. There were no "Weekly Homeless Meetings" on Carter's schedule before June 5. De Blasio spokeswoman Karen Hinton said the meetings began in June because the city began noticing an uptick in its homeless shelter population. Department of Homeless Services records show a slight uptick in the shelter population starting in June when the number of single adults in shelter rose 1.3 percent to 12,086 in August from 11,934. "The number of homeless people going into shelter was increasing over the summer and we were meeting to see what we would do about it," said Hinton, who said she sat in on at least one of the meetings. It wouldn't be unusual for the mayor along with Carter, Department of Homeless Services Commissioner Gilbert Taylor and his staff, Human Resources Administration head Steven Banks and former Deputy Mayor for Health and Human Services Lilliam Barrios-Paoli to be in the room, she said. "They talk about what's working, what's not working, the issues in the shelter and what do we need more of," said Hinton. "It's just touching base." Hinton said the meetings don't contradict de Blasio's public rhetoric because his comments were mostly referring to street homelessness and the meetings dealt mostly with shelters and supportive housing, although street homelessness, which de Blasio was facing the most public criticism for this summer, was also discussed. "I'm sure there was discussion of street homelessness but mostly they were about shelters and supportive housing," Hinton said. The meetings show a level of concern on the issue that de Blasio did not publicly display early in the summer when he was facing criticism for an increase in the visible homeless population. De Blasio downplayed the extent of street homelessness, expressing concern but saying at a July 9 press conference that "the reality is a little different" than people's perceptions because "the actual number of street homeless has gone down a bit." While the annual survey of street homeless, which is conducted in the winter, found approximately 3,000 people living on the street, a slight dip from the year before, most advocates say the actual number is much higher. George McDonald, founder of the Doe Fund which provides work, housing and social services to the formerly homeless and formerly incarcerated, ran for mayor as a Republican in 2013. He said the meetings show the de Blasio administration was "caught off guard" about the response to an increase in homelessness. "Noone can deny what every New Yorker saw with their own eyes this summer," McDonald said. "It's hard to believe the mayor was oblivious to all of that." Jean Rice, a board member of homeless advocacy group Picture the Homeless, said if the administration suddenly felt the issue was urgent enough to inspire weekly meetings, he would have liked to see groups such as his invited to offer suggestions. "Enhancing the shelter complex is like putting a Band-Aid over the dyke," Rice said. "If you do more of the same you will get more of the same results." Hinton said the meetings show the mayor taking action on an important issue. 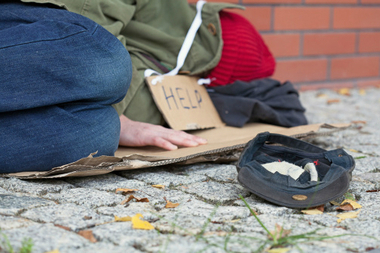 Since initially denying there was a homeless problem, the mayor has rolled out a series of initiatives to address it. The city is spending $1 billion more on homelessness over four years than previously planned. 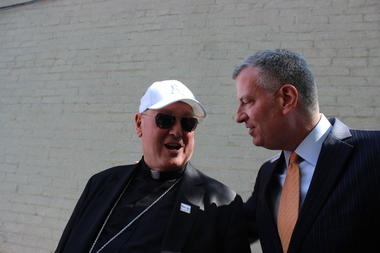 And just before Pope Francis' visit to the city, de Blasio and Cardinal Timothy Dolan announced a $12 million plan to have faith-based groups around the city provide 500 beds. "The mayor increased the homeless budget by $1 billion," said Hinton. "You don't throw a billion dollars at a problem and not talk about it."